Do you know how to make the apple pandowdy recipe? 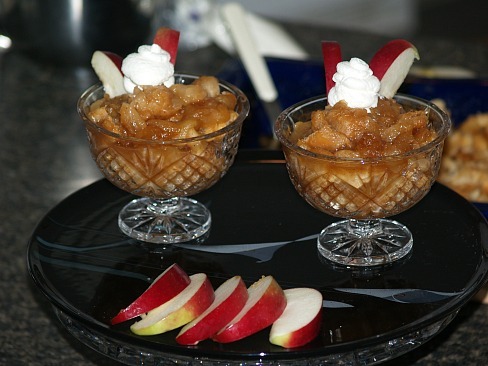 This recipe like many of our current apple dessert recipes originated in early pioneer cooking. Although this is not one of the more popular recipes that we bake today with pie apples as are the apple bread recipes or apple coffeecakes, we may eat pandowdy and really not know that we are. The original recipe as with many recipes throughout the history of apples started out being cooked in a cast iron skillet over the open fire. Similar to the apple pie recipes and apple tart recipes, today you will find recipes with instructions to bake it in anything from a regular pie pan, a deep dish pie plate to a casserole baking dish or pan. Regardless of what you bake it in makes no difference in the name of apple pandowdy. If you know how to make the apple pandowdy recipe, it is basically apples and maybe sugar and spices in the bottom of the dish or pan. The top is covered with some form of dough like thick pie or pastry dough or even shortcake biscuit recipe for the dough. This is then baked until the dough is done and browned producing a wonderful apple dessert or even apple snack. The type of dough also has no bearing on what makes this dessert a “pandowdy”. The keyword to this recipe is “pandowdy”. This word is taken from the word “dowdy” which means messing up or messy (Simply put, messing in the pan). Many recipes will not tell you this nor will they tell you to mess your dish up after baking, but this is exactly what an apple pandowdy is. 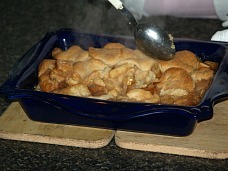 After the recipe is baked, you simply break up the baked dough or crust and stir into the apple mixture in the bottom. Sometimes you might bake it completely and other times you might bake it partially, then after mixing in the crust return it to the oven. The dough is flavored with the hot juices from the baked apples which make the whole thing delicious. I also have another take on the origination. I know years ago women especially prided themselves on the beauty of their apple pies. Many could not make a pie which held together nicely when cutting so this became a perfect excuse for a new dessert. Cut in shortening until resembling a coarse meal. Add enough milk until forming a soft dough. Turn out on floured surface and knead lightly for 1 minute. Cut and use as directed in each recipe. 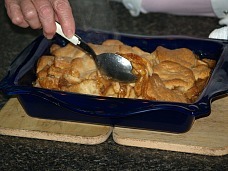 Combine apples, sugar, nutmeg, cinnamon, molasses and water in greased 1 ½ quart casserole dish. Scatter pieces of butter on top. 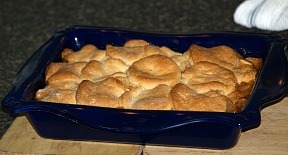 Prepare shortcake biscuit dough; roll or pat ¼ inch thick to fit dish and place on top of apples. Bake uncovered for 35 to 45 minutes or until dough is done and apples are tender. Stir baked dough into apple mixture and serve with cream. NOTE: Let set 10 minutes before serving; the dough will absorb the juice of the apples. 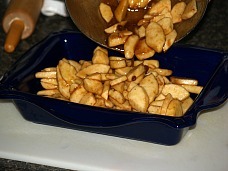 Mix sugars, cinnamon, nutmeg and salt in a large bowl; stir in the apples. Spoon apple mixture into ungreased 2 quart casserole baking dish. Dot top with the butter. Prepare pie pastry recipe according to directions; roll into shape to fit baking dish on top of apples. Cut slits in dough near the center. 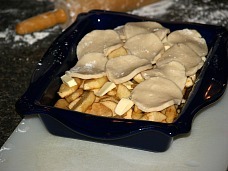 Bake 30 minutes; cut piecrust into small pieces with sharp knife mixing pieces into the apples. Bake about another 30 minutes or until apples are tender. Mix flour and salt; cut in shortening until crumbs are size of small peas. Sprinkle in water 1 tablespoon at a time tossing with fork until all flour is moist. Gather dough in a ball; roll and cut as your recipe directs. Makes 1 9 inch pie crust. Toss apples with maple syrup, lemon juice, cinnamon and nutmeg in large bowl. Spoon in 8 inch baking dish; dot with butter. Prepare pastry dough recipe; roll into 9 inch square on floured surface. Place dough on top of apples; press down along sides of dish. Cut large vents in dough to allow steam to escape. Brush dough with milk and sprinkle with sugar. Bake for 25 to 30 minutes or until crust is light brown; remove from oven. With sharp knife cut crust into 2 inch squares; mix crust with apples and juice. Return to oven and bake about 20 to 25 minutes longer or until pieces are deep golden brown.